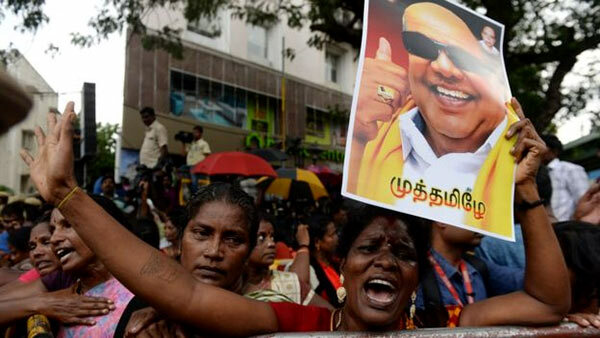 Sri Lanka today mourned the death of veteran Indian politician M K Karunanidhi. President Maithripala Sirisena tweeted saying he was deeply saddened by the death of Karunanidhi and expressed his condolences to Karunanidhi’s family. Former President Mahinda Rajapaksa also tweeted saying he was deeply saddened by the demise of the former Chief Minister of Tamil Nadu, Karunanidhi. “His contributions to Tamil literature, cinema and politics are unparalleled. I join the millions of people who are mourning. My deepest condolences to the family and people of Tamil Nadu,” Rajapaksa tweeted. Karunanidhi died at the age of 94. He was being treated for age-related illnesses in Chennai (formerly Madras) in southern India’s Tamil Nadu state. Karunanidhi served as the chief minister of Tamil Nadu five times between 1969 and 2011, and also played a key role in federal politics. He contested – and won – 13 elections in the state. During and soon after the war in Sri Lanka, Karunanidhi spoke out against the Sri Lankan Government and demanded an end to the war and a solution to the issues faced by Tamils in Sri Lanka.